News & Updates - Arlington Works! For the Martin Luther King Jr. Day of National Service, the Arlington Works! AmeriCorps members, Program Director, two site supervisors, and three volunteers went to Opportunity Place, the day center of the Arlington Street People’s Assistance Network (A-SPAN). At Opportunity Place, people that are experiencing homelessness can shower, get clothes, do laundry, apply for benefits, or talk to a career counselor. When the team arrived, an A-SPAN staff person talked to the group about homelessness in Arlington and A-SPAN’s services. He also gave a tour of the facility and then split the team into groups by tasks – organize donated clothing and toiletry items, clean the floors and walls to disinfect during flu season, do paint touch-ups, and do other deep cleaning. This was the third year Arlington Works! has partnered with A-SPAN for MLK Day. Thank You Edu-Futuro & Deloitte. for sponsoring this wonderful opportunity! 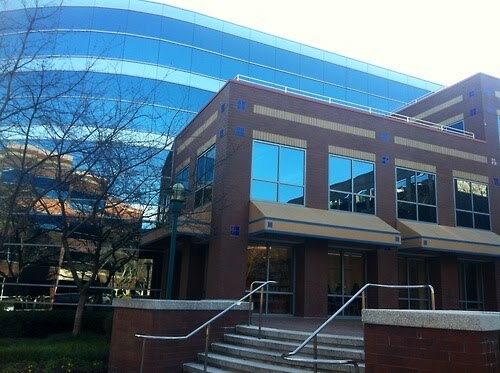 As of January 2013 WE ARE OFFICIALLY MOVED IN! Every year, AmeriCorps Week recognizes the commitment of AmeriCorps members and alums by highlighting the impact that AmeriCorps makes across the nation. This year, AmeriCorps week is taking place from Saturday, March 10 through Sunday, March 18. The two goals of AmeriCorps Week are to connect AmeriCorps members and alums and highlight their roles as a part of a nation-wide volunteer movement, and to communicate the powerful impact that AmeriCorps members have on critical problems in communities across the nation. The Arlington Works! team has an exciting week of volunteerism and community outreach planned. 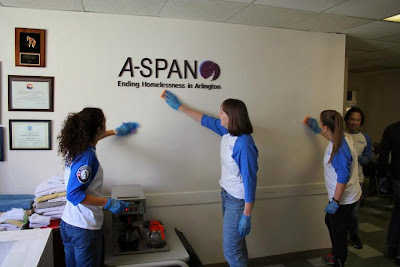 Join us and help us spread the word about AmeriCorps in Arlington! March 10 - Arlington Works! is kicking off AmeriCorps Week on March 10th in a school yard work day at Campbell Elementary School. Arlington Works AmeriCorps members and Edu-Futuro's Emerging Leaders Program will be volunteering alongside Campbell Elementary School staff, students and parents. The event supports Campbell's participation in Plot Against Hunger for the Arlington Food Assistance Center. March 12 - One of our AmeriCorps members will attend a networking event and community fair sponsored by the Women's Information Network to share information about Arlington Works! AmeriCorps and AmeriCorps opportunities throughout the metro area. March 14 - All 6 Arlington Works! will attend a workshop at the Corporation for National and Community Service headquarters in Washington, DC. They will meet other AmeriCorps members and staff and gain tools, resources and strategies for maximizing service experience, professional background and education to make an impact. March 16 - Arlington Works! AmeriCorps is organizing and hosting a Life After AmeriCorps networking event at the Clarendon Education Center. All Northern Virginia AmeriCorps members and alums are invited! Arlington Works! will be joined by AmeriCorps members from the Literacy Council of Northern Virginia and Greenbriar Learning Center. March 17 - Jessie Ferguson, currently serving as the Emerging Leaders Program Coordinator at Edu-Futuro, will give a presentation to the Emerging Leaders Group highlighting AmeriCorps and the importance of service. Arlington County Government is holding an informational career fair tomorrow at the Arlington Employment Center, one of the Arlington Works! partner organizations. The career fair will take place on Wednesday from 10:00 a.m.-2:00 p.m. in the lower level auditorium of the Arlington Employment Center (2100 Washington Blvd). More than 900 people are already registered to attend, and 22 Arlington County agencies will have information about job openings. The job fair is informational, no resumes will be accepted. All Arlington Country job applications are accepted online at their website. Arlington Works! AmeriCorps members Anna Cupito and Sara Fry will be assisting at the fair.